Signup to become part of our cat rescue network! *Did you adopt from HK Alley Cat Watch? We love to receive photo updates of your family members. Please send to us at photos@hkalleycatwatch.com. Thanks. *Fostering cats - We have kittens and cats needing short-term foster homes. Pls fill in our foster registration form and become part of our foster network. * For Cat Cruelty Cases please be sure to inform the SPCA Insepctor Hotline at (T) 2711 100. Then make sure you report the incident to the police. * Does your cat have an amazing story to tell? Please send us in your amazing cat tales, with photos to madtemple@hotmail.com and your cat could be featured in our next greeting cards due to be printed. Help us help more cats with your wonderful cat stories. * * WE NEED YOU! Please register as a Foster Parent. If you live in Central or HK side, this would be extremely helpful to us. We always require reliable foster parents. Get in touch with us straight away, thanks. * Please check out this great article from BestFriends.org on "FIV - Catching a bad case of the Rumours". Also read the FIV Fact sheet. * Please be sure to subscribe to our Cat News & Updates in the top right hand corner of our home page. By subscribing you can help us help more cats needing homes, and keep up to date with all our local cat news. *Taking your cat to the UK. Read all about the New Pet Travel (PETS) Scheme. No more quarantine! Find out how to take your pet overseas yourself to reduce costs. Visit the AFCD website to find out more. *Get info on how to effectively and inexpensively cat proof your windows. Visit our Cat Proofing Page. 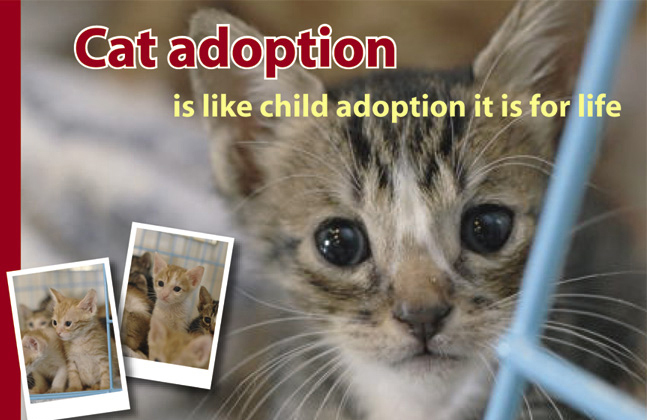 Cat Adoption is like Child Adoption it's for life! Hong Kong Alley Cat Watch was set up as a Society in 2003 by Marian Banaghan who has been on the Mid Levels street cat circuit since 1997, and Michelle Temple who has been an avid cat lover all her life. More recently Michelle is foster mum to a majority of the rescued street orphans many of which have been successfully homed by HK Alley Cats Watch. For all Adoption Enquiries you can expedite the process by filling in an Adoption Registration Form which will help us to make an immediate assessment as soon as possible! Click here to Read our Adoption Requirements page. You can download the Adoption Registration Form & email it back to us! Thanks. At present donated funds go toward street cats with injuries and newborn kittens needing urgent medical care. Due to a lack of regular funding we only have enough funds to treat cats in our neighourbood but hopefully this will change in the future. Since our website was launched in early 2004 we have been inundated with pleas for help, and although we strive to do everything we can to help, it is impossible to continue on such a large scale. We are only infact two people with a handful of foster homes and no other facilities in which to house the cats and kittens awaiting adoption. Although we will persevere in our efforts to help our feline friends, our main emphasis is TNR, and we encourage more people to get involved as we believe strongly that this initiative offers the best solution in decreasing the number of kittens born and abandoned on our streets. If you are interested in helping in TNR, please call the SPCA’s headquarters in Wanchai on 2802 0501 and ask to be put through to the Cat Colony Care department. We have recently been inundated with stray cat calls. Due to the fact we are two people and a handful of foster volunteers, we are physically unable to deal with many rescue situations - we are simply not equipped. We urge people to contact the SPCA. We will continue to welcome calls concerning orphaned new born kittens, though this depends solely on there being ‘enough room at the Kitty Inn’. We are more than happy to point people in the right direction. If you do find a kitten or a cat, our main obstacle is not having anywhere to board them as we DO NOT HAVE A CENTRE, all fostering is done from people's homes. You would be helping by keeping the stray at your house until it's healthy, or until we can at least find an alternative foster or permanent home. Please visit our Adoption Gallery page for a detailed description of cats available for homing and our Success Stories page. If you have adopted a cat through HK Alley Cat Watch, a picture of you & your moggy will be there. To answer any health queries you may have about your cat, please visit our Vets Questions & Answers page. An updated Q&A is posted each month, if you would like to have a question answered by a vet you can email us directly. We ask potential families to think long and hard before adopting, especially if you know you will eventually leave Hong Kong as it's much harder to find a home for an older cat than it is a kitten. We encourage any family leaving HK to consider taking their companions with them, unless of course the best homes can be found for them.